Waterfront timber frame house in Annapolis, MD. Private, wooded setting with excellent views. Please inquire to the property owner for accurate rates and quote. Please know that the instant quote button may quote actual rates slightly off as our price per night decreases the longer your stay. So, please inquire to the owner. Thank you for your patience while HA perfects their new software. This house is an energy efficient 14 year old house perched atop a small bluff overlooking picturesque Mill Creek and an agricultural preserve. The house is in a quite peaceful setting, set just above the water's edge and not visible from the road. Only a few neighboring houses are visible. The house has wood floors throughout and beautiful post and beam construction and details visible in all rooms. The house is furnished with comfortable furnishings. Chairs on the waterfront decks make for peaceful vistas, daydreaming or conversations. Quiet peaceful setting with activity at your door: Canoe, kayak or rowboat available for exploring the quiet creek. 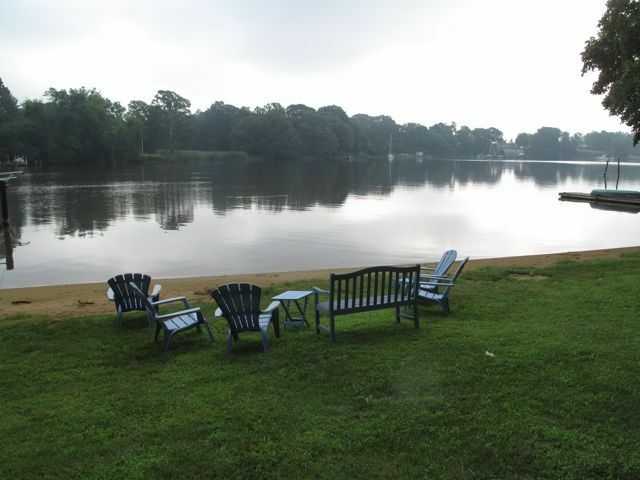 Enjoy fishing or crabbing from the dock or swimming from the sandy beach. 3 miles to USNA, Historic Annapolis, and the City Dock. Enjoy Annapolis, the USNA activities, and the surrounding Annapolis area from this unique water front home located close to the hub of activity but located such that you can come 'home' and relax. While peaceful and serene, the house does have WiFi high speed internet, Cable TV, DVD player available. Fully equipped kitchen with all electric appliances for those that chose to cook and dine in. To enjoy a larger beach with a few more people, visit Sandy Point State Park and lifeguarded beach is only 5 minutes away. Bring your ski boat, windsurfer or daysailor. Crewed and bareboat charter boats available nearby. Drive to the nearby Greenbury Point Nature Preserve to take a hike, watch birds an/or boats on the Chesapeake Bay. From the point is a wonderful view of Annapolis Historic District, the USNA, Eastport, the Chesapeake Bay Bridge and the Chesapeake Bay. 2 miles away is the start of the Baltimore Annapolis bike trail with interconnection to the BWI Airport and Elkridge bike routes. With only minor planning, a century ride on paved trails is very easily accomplished. Coming for the Boat shows? Stay here! When you tire at the end of the day, simply return to this peaceful house and setting, park at your door step, kick your feet up, enjoy a night cap overlooking the water, anchored boats, wildlife before turning in for a restful sleep with out the hustle & bustle of hotel or in town accommodations. A haven to visit your Mid or take in a USNA event: Perfect for the family visits with your Mid be it for Induction Day, Parents' Weekend, or any time they are available for a visit. Planning on visiting your mid but no place to go to let him/her relax without feeling like a caged animal stuck in a hotel? Try our 'Treehouse' on the water. You, your family and your mid will enjoy the relaxing setting. Brothers and sisters will have something to do without getting underfoot. Your mid can zone out and let down from his/her normal pressures and you, as parents, will have the opportunity to await the mood for a meaningful visit. Alternately, planning to catch a USNA Football, Soccer, Basketball or other sports event? Or Perhaps an Alumni event? Stay here. It is perfect for a couple, a family, or even 3 couples. Property caretakers nearby for resolution if problems develop. Quite time 11 PM to 7 AM (AACoMD noise ordinance prohibit excess of 65Db during these hours). RESIDENTIAL USE ONLY - No business nor commercial activities may be conducted on the premises. House nestled on top of a 60 bluff in a wooded setting of mature trees overlooking Mill Creek, an agricultural preservation area. During the weekends, it is common for sailboats to anchor nearby. The resident blue heron typically is on the end of the dock of at the water edge morning and night. High speed internet & wifi. Cable. The living room, dining room and 2 of the 3 three bedrooms have balconies that overlook the water. The house itself was fantastic. Exactly what you expect from the pictures if anything it was a little more upgraded than I predicted. The beachfront pictures are deceiving as it looks like it’s directly in front of the property. While it is connected and there’s an incredible amount of private and very open space with docs to you. It requires 50 stairs to access. Not a huge deal I just wish it was disclosed as I have two young children. The house itself was fantastic. Exactly what you expect from the pictures if anything it was a little more upgraded than I predicted. The beachfront pictures are deceiving as it looks like it’s directly in front of the property. While it is connected and there’s an incredible amount of private and very open space with docs to use. It requires 50 stairs to access. Not a huge deal I just wish it was disclosed as I have two young children. It’s very close to everything you could need. Rather it be downtown Annapolis, Food, shops, entertainment. We would definitely return to this exact property. The location of this property is absolutely perfect. The view is fantastic and it is extremely peaceful and quiet. The house is delightful, extremely clean and accommodating. The house was ideal for our visit. The house provided everything we needed. It was very clean and comfortable. Better than advertised - Great family getaway! We can’t say enough great things about Bob’s Treehouse on Mill Creek. We had a wonderful Thanksgiving with family and friends, and it almost felt like home. Sometimes you don’t know what to expect, but this was better than expected. The place was clean, well stocked, and right on the water! You feel like you’re out in the country, but the house is literally five minutes from Annapolis. How can that be? Definitely a place we could visit again. This house was very comfortable for our family with teenagers. Beautiful location on a steep ridge above the bay inlet. House was very charming, apparently originally built by a shipbuilder. Easy 5-10 minute drive to downtown Annapolis and very close to a bike rail trail. Try the crabhouse at the end of the street. Definitely recommend a stay. Deep water in Annapolis, MD. Close to the United States Naval Academy, Annapolis Historic district, Annapolis City Dock, USNA Stadium, United States Sail and Power boat shows, Sandy Point State Park, Greenbury Point Nature Preserve, USNA Golf Course. Washington DC, Smithsonian Museums, Nation's Capital memorials and Baltimore Inner Harbor are within 30 minute drive as are the DC Nationals, Baltimore Orioles, Washington Red Skins and Baltimore Ravens stadiums. Easy access to the Baltimore/Annapolis bike trail. House located on the quiet deep protected waters of Mill Creek of the Chesapeake Bay. Seafood and other fine dining at many nearby seafood restaurants. The caretaker lives next door in the event of problems.